This exclusive delicious and decadent array of chocolates and chocolate snacks is perfect for sharing with family, friends, or at the office. The woven seagrass tray basket is brimming with chocolate covered pretzels & OREO Cookies, chocolate nut barks, chocolate pecan clusters, and Tuxedo Decadence nut mix. Stylishly presented with a sleek satin Simply Chocolate signature ribbon. 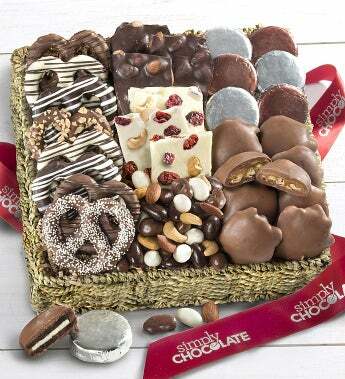 Gift measures 10" x 9.5" x 4"
This exclusive delicious and decadent array of chocolates and chocolate snacks is perfect for sharing with family, friends, or at the office. The woven seagrass tray basket is brimming with chocolate covered pretzels & OREO Cookiess, chocolate nut barks, chocolate pecan clusters, and Tuxedo Decadence nut mix. Stylishly presented with a sleek satin Simply Chocolate signature ribbon.